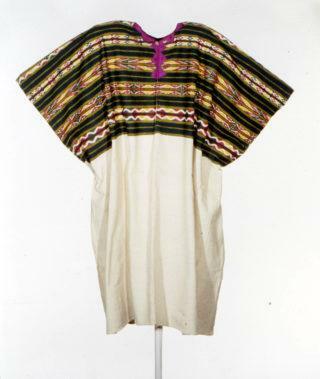 The Central American Collection is small but significant. One of the great treasures of the Hearst Museum are the Guatemalan textiles, representing over a century of acquisitions. After the comprehensive and well-documented collection (the largest from the 19th century) gathered by Gustavus A. Eisen in 1902, came textile scholar Lila O’Neale’s study collection of 1936. With the addition of smaller donations, the Hearst Museum now curates more than 1000 textiles from this small Central American nation. In addition to the collecting of textiles and other contemporary objects, Gustav Eisen returned from his 1902 expedition in Guatemala with a small number (about 200) of archaeological objects. Among them, the stone idols from a cave near San Juan Ixtan and the pottery appliques from the site at Zaculeu are of particular interest given their common provenience. 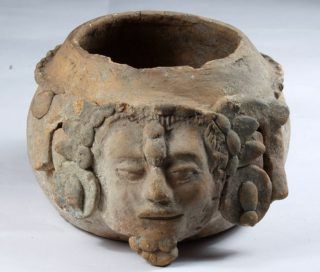 An additional, also small, archaeological collection from Guatemala was acquired by the museum through the work of Robert Heizer and John Graham near the Temple of Montezuma in the Jutiapa district. This collection includes multiple obsidian cores and blades that, in a later paper, Heizer argued they represented the remains of a small workshop specialized in obsidian procurement that was established along the southernmost border of the Maya territory. The Hearst Museum is one of the institutions that curate different parts of a vast collection accumulated by Mr. J. A. McNiel in over two decades of explorations in the Chiriqui region of Panama. Nearly 1200 objects collected by him in 1882 were accessioned in 1904 and had been exhibited to the public multiple times. This collection and one of ancient pottery from Costa Rica donated by M. Rivera in 1971 offer a great overview of the pre-contact material culture of the Central American western coast. 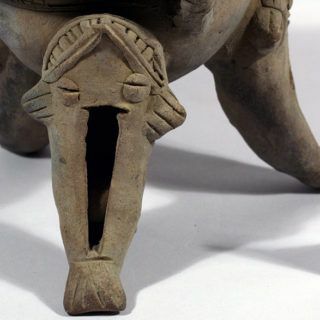 The Central American archaeological collections include the objects excavated by James Bennyhoff and Clement Meighan from multiple sites on the northern coast of Belize (then British Honduras) in 1950 with the purpose of locating post-classic Maya settlements. This assemblage is one of the few systematically excavated that are curated outside of Belize and it is accompanied by multiple notebooks and field notes that make it an invaluable resource for Central America scholars. The Bennyhoff-Meighan collection has interesting connections with a small (about 300 objects), mostly ceramic, assemblage salvaged by David K. Evans on the Roatan Island in Honduras, in 1961 during his post-graduate studies at Berkeley. The collection is important because during the 20th century the archaeological record of the Bay Islands has been seriously depleted by looting and by selling artifacts to tourists and there is little left of the material culture used by the original population, which was completely eradicated from the Islands by 1650 and that, by historic accounts, had links to the mainland Maya population. Visit the North American Collections for information about the Museum’s Mexico collections.